* I highly recommend starting a “bath and beauty making” set of tools. I use an old saucepan, separate utensils, cutting board, and an old ceramic bowl. This way, I never have to worry about reusing them for food prep. 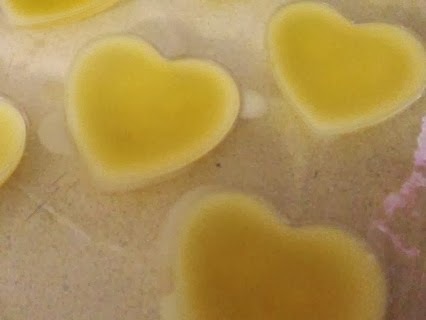 * While you can use the microwave for this tutorial if you heat in a microwave-safe bowl, I recommend sticking with a stovetop, as you’re much more likely to get an even heat without burning any of your ingredients (or yourself). 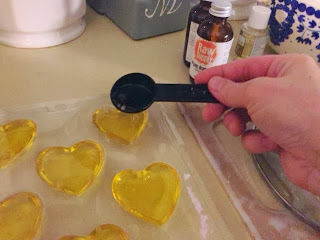 * I used a soap mold for these, but you can use just about anything that will hold shape and is flexible enough for you to remove the solid bars. I frequently use recycled yogurt containers, silicone cupcake molds, ice cube trays, etc. 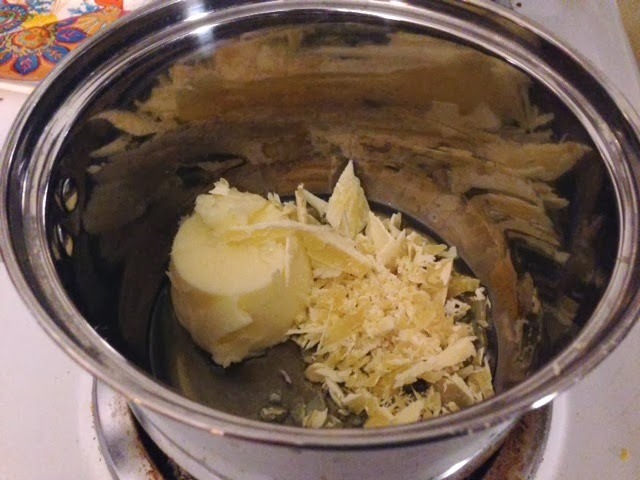 First, you’ll need to measure out your cocoa/shea butter and add to your saucepan. Place it on a medium low heat and let it start to melt slowly. Do NOT turn your burner above a medium heat, as you don’t want this to boil or risk burning. SLOW is key. Allow the butter and beeswax to fully melt. 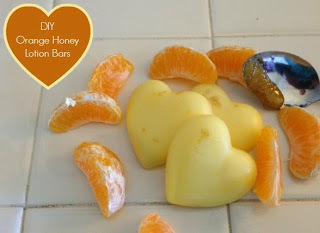 Lastly, add your honey and your orange essential oil and allow those to melt. Note: Citrus essential oils will often bubble or fizz when added to hot oils and/or create little “balls” of oils. This is normal. Just keep stirring slowly until the balls are incorporated into the oil. The fizzing will stop when you remove it from the heat. Now, remove your oil from the heat and pour into your molds right away. Do this quickly because the oils will start to cool off and solidify rapidly. And now you wait. They’ll start to solidify in the molds quickly. This photo was taken about 15 minutes after I poured the oil into the molds, and you can see the bars are starting to solidify around the edges. Give them a few hours, depending on the size of the mold. Obviously bigger shapes will take longer. Then plop them out onto some waxed paper and allow to set at least overnight to really solidify. I leave them out on my counter, but you can place them in the fridge as well. To preserve, wrap in plastic wrap, place in a baggie, or in an airtight container. These will last a long time if you preserve nicely. Note on cleanup: I leave my tools to set out and dry overnight. The oils are much easier to clean up once they’ve solidified. Do not try to wash them right away. 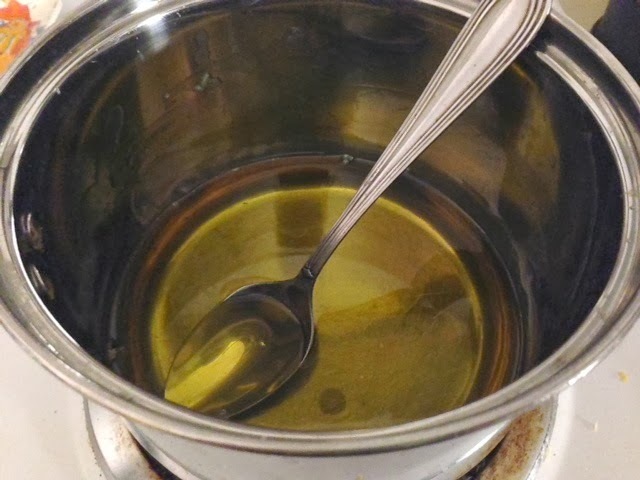 Adding water to the oil will just make a slimy, sticky mess. 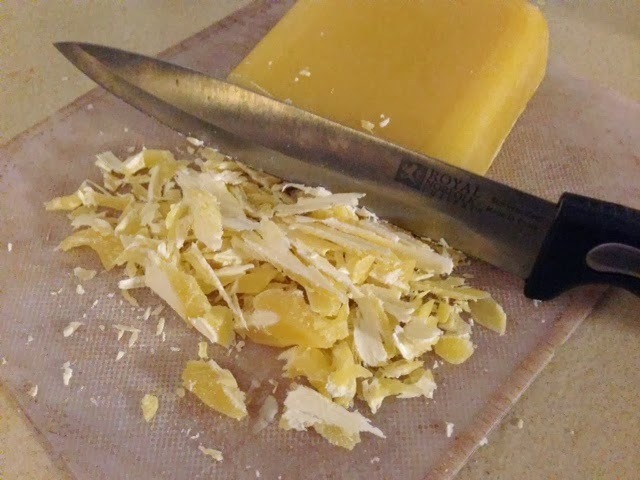 Let them dry, then the next day, scrape away with a scraper and wipe clean with a towel. Easy as pie. 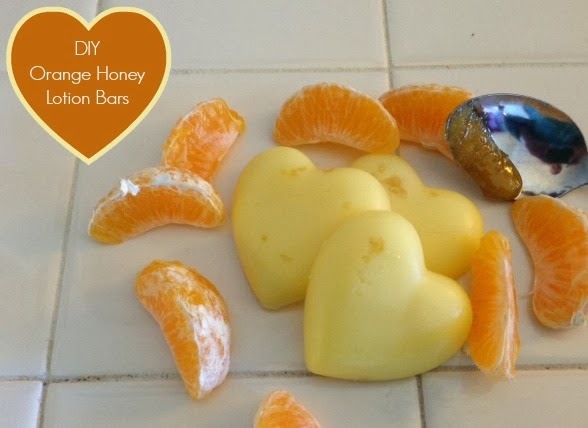 I love the Orange Honey scent, but these are super easy to change up to your preference. 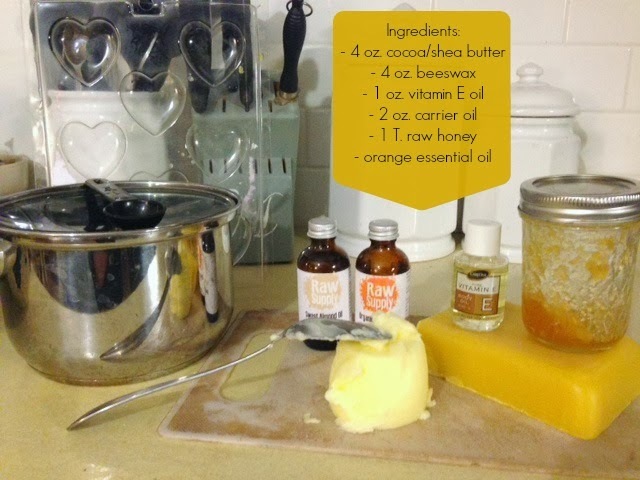 The honey can be left out and just about any essential oil can be substituted to change it up. I hope you enjoyed this tutorial! I’ll be back soon with more great DIYs! My honey sank to the bottom of the mold.. kind of separated from the lotion.. Should I have mixed it more?